A taxonomy is a "classification in a hierarchical system" (Wiktionary). In the jABC someone can get a logical view on a set of SIBs by means of taxonomies. So besides the classification of SIBs by the file system, there is a second classification, which can be edited by user, so that the taxonomy fits the user's needs best. The SIBs are classified in categories, which are called (as in a file system) folders. These folders are (like in a file system) hierarchically organized. That means that a folder not only can contain SIBs, but also folders. Each SIB can potentially be at various places in the taxonomy. Furhtermore it does not appear with its real class name, but with an editable alias. If there is no alias, the default value is the name of the class of the SIB. 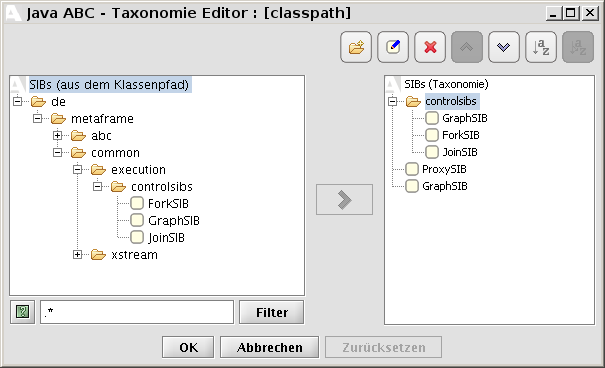 By means of the use of aliases can one SIB for example appear at one place of the taxonomy under its English caption and at another place under its German one. The Taxonomy Editor Manual is part of the general jABC Manual.